The Royal Abbey of Our Lady of Fontevraud or Fontevrault (in French: abbaye de Fontevraud) was a monastery in the village of Fontevraud-l'Abbaye, near Chinon, in the former French duchy of Anjou. It was founded in 1101 by the itinerant preacher Robert of Arbrissel. The foundation flourished and became the center of a new monastic Order, the Order of Fontevrault. This order was composed of double monasteries, in which the community consisted of both men and women—in separate quarters of the abbey—all of which were subject to the authority of the Abbess of Fontevraud. 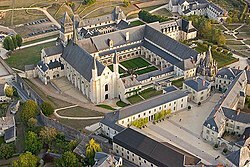 The Abbey of Fontevraud itself consisted of four separate communities, all completely managed by the same abbess. The first permanent structures were built between 1110 and 1119. The area where the Abbey is located was then part of what is sometimes referred to as the Angevin Empire. The King of England, Henry II, his wife, Eleanor of Aquitaine, and son, King Richard the Lionheart were all buried here at the end of the 12th century. It was disestablished as a monastery during the French Revolution. The Abbey is situated in the Loire Valley, a UNESCO World Heritage Site, between Chalonnes-sur-Loire and Sully-sur-Loire within the Loire-Anjou-Touraine French regional natural park (Parc naturel régional Loire-Anjou-Touraine). The complex of monastic buildings served as a prison from 1804 to 1963. Since 1975, it has hosted a cultural centre, the Centre Culturel de l'Ouest. Robert of Arbrissel had served as the Archpriest of the Diocese of Rennes, carrying out the reformist agenda of its bishop. When the bishop died in 1095, Robert was driven out of the diocese due to the hostility of the local clergy. He then became a hermit in the forest of Craon, where he practiced a life of severe penance, together with a number of other men who went on to found major monastic institutions. His eloquence and asceticism attracted many followers, for whom in 1096 he founded a monastery of canons regular at La Roë, of which he was the first abbot. In that same year Pope Urban II summoned him to Angers and appointed him an apostolic missionary, authorizing him to preach anywhere. His preaching drew large crowds of devoted followers, both men and women, even lepers. As a result, many men wished to embrace the religious life, whom he sent to his abbey. When the canons of that house objected to the influx of candidates of lower social states, he resigned his office and left the community. Around 1100 Robert and his followers settled in a valley called Fons Ebraldi where he established a monastic community. Initially the men and women lived together in the same house, in an ancient ascetic practice called Syneisaktism. This practice had been widely condemned by Church authorities, however, and under pressure the community soon segregated according to gender, with the monks living in small priories where they lived in community in service to the nuns and under their rule. They were recognized as a religious community in 1106, both by the Bishop of Angers and by Pope Paschal II. Robert, who soon resumed his life of itinerant preaching, appointed Hersende of Champagné to lead the community. Later her assistant, Petronilla of Chemillé, was elected as the first abbess in 1115. Robert wrote a brief Rule of Life for the community, based upon the Rule of St. Benedict. Unlike the other monastic orders characterized by double monasteries, the monks and nuns of the Order of Fontevrault followed the same Rule. In his Rule, Robert dealt with four principal points: silence, good works, food and clothing, encouraging the utmost in simplicity of life and dress. He directed that the abbess should never be chosen from among those who had been brought up at Fontevrault, but that she should be someone who had had experience of the world (de conversis sororibus). This latter injunction was observed only in the case of the first two abbesses and was canceled by Pope Innocent III in 1201. At the time of Robert's death in 1117, there were about 3,000 nuns in the community. In the early years the Plantagenets were great benefactors of the abbey and while Isabella d'Anjou was the abbess, King Henry II's widow, Eleanor of Aquitaine, made the abbey her place of residence. Abbess Louise de Bourbon left her crest on many of the alterations to the abbey building which she made during her term of office. With the passing of the Plantagenet dynasty Fontevrault and her dependencies began to fall upon hard times. At the end of the 12th century, the Abbess of Fontevrault, Matilda of Flanders (1189-1194), complained about the extreme poverty which the abbey was suffering. As a result, in 1247 the nuns were permitted to receive inheritances to provide income for their needs, contrary to monastic custom. The fragile economic basis of the Order was exacerbated by the devastation of the Hundred Years War, which lasted throughout the 14th century. A canonical visitation of fifty of the priories of the Order in 1460 showed most of them to be barely occupied, if not abandoned. The Order was dispersed during the French Revolution. In November 1789, all property of the Catholic Church was declared to be the property of the nation. On 17 August 1792, a Revolutionary decree ordered evacuation of all monasteries, to be completed by 1 October 1792. At that time, there were still some 200 nuns and a small community of monks in residence at Fontevraud. The last abbess, Julie Sophie Charlotte de Pardaillan d'Antin, is said to have died in poverty in Paris in 1797. The abbey became a prison in 1804. The prison was planned to hold 1,000 prisoners, and the former abbey required major changes, including new barracks in addition to the transformation of monastic buildings into dormitories, workshops, and common areas. Prisoners–-men, women and children-–began arriving in 1814. Eventually, it held some 2,000 prisoners, earning the prison the reputation of being the "toughest in France after Clairvaux". Political prisoners experienced the harshest conditions: some French Resistance prisoners were shot there under the Vichy Government. In 1963 it was given to the French Ministry of Culture, and a major restoration was undertaken. In 1975 the Centre culturel de l'Ouest was formed to preserve the abbey and promote it as a cultural venue. The complex was opened to the public in 1985. Restoration of the abbey church's restoration under architect Lucien Magne was completed in 2006. Alice of Blois (1228-1244) daughter of Theobald V, Count of Blois, and his second wife Alix of France. West facade of the church. Inside view of the nave. View of the choir, the ambulatory and the choir's chapel. The abbey was originally the site of the graves of King Henry II of England, his wife Eleanor of Aquitaine, their son King Richard I of England, their daughter Joan, their grandson Raymond VII of Toulouse, and Isabella of Angoulême, wife of Henry and Eleanor's son King John. However, there is no remaining corporal presence of Henry, Eleanor, Richard, or the others on the site. Their remains were possibly destroyed during the French Revolution. The bodies of the French monarchs were likewise removed from the Basilica of St Denis in 1793 by order of the French government. Henriette Louise de Bourbon, granddaughter of Louis XIV and Madame de Montespan, grew up here. Princess Thérèse of France, daughter of Louis XV, is also buried there. Jean Genet described the experiences of a thirty-year-old prisoner at Fontevrault in his semi-autobiographical novel, Miracle de la rose, although there is no evidence that Genet was ever imprisoned there himself. La Cage aux Rossignols (A Cage of Nightingales), a French film released in 1945, was filmed at the abbey. ^ a b "Reigning Abbess Julie Sophie Charlotte de Pardaillan d'Antin of the Royal Abbey of Fontevraud (France)". Women in Power. ^ "Transformation de l'Abbaye en Prison". l'Abbaye de Fontevraud. Archived from the original on 20 August 2012. Retrieved 19 August 2012. ^ Vincent 2007, p. 331. ^ Berman 2018, p. 75. ^ Lindsay, Suzanne Glover. "The Revolutionary Exhumations at St-Denis, 1793". Center for the Study of Material & Visual Cultures of Religion. Yale University. Vincent, Nicholas (2007). "The Court of Henry II". In Harper-Bill, Christopher; Vincent, Nicholas. Henry II: New Interpretations. The Boydell Press. Berman, Constance Hoffman (2018). The White Nuns: Cistercian Abbeys for Women in Medieval France. University of Pennsylvania Press. Müller, Annalena (2014), Forming and Re-Forming Fontevraud. Monasticism, Geopolitics, and the Querelle des Frères (c. 1100-1643), doctoral dissertation, Yale University 2014. Wikimedia Commons has media related to Fontevraud Abbey.